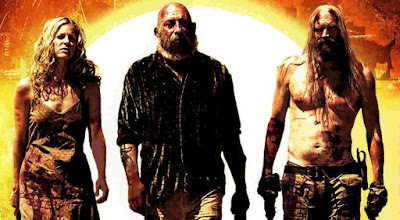 Rob Zombie appeared earlier this week on Trunk Nation, Eddie Trunk's radio show, and had a few thing to say about 3 From Hell and when the editing process will begin. "It's the third part of my sort of trilogy that started with 'House Of 1,000 Corpses', then it was 'The Devil's Rejects' and now it's this movie called '3 From Hell'. It's the third part of that series.We're done shooting it. I finished about two weeks ago. And, basically, the process just stops and waits for me. 'Cause the film will just basically sit and wait till I get back from tour, which is the end of August, maybe… I don't remember when ['The Second Coming'] tour [with Marilyn Manson] ends… beginning of September. And then we'll start editing. And that'll take me through the rest of the year." Asked to name his favorite part of the movie-making process, Rob said: "I like all of it. It's all a process that I enjoy. Shooting is great. Shooting is actually the fastest part of it. "This film probably had two solid years of pre-production to get it going, 'cause getting these movies going sometimes feels close to impossible," he explained. "And then the shoot is so fast. And then the editing will be five or six months, maybe. But I like it. I have a studio at my house, and we just bring the editors there and set up and we just sequester ourselves away. It's actually the same studio we make the records in; we just switch out the gear." 3 From Hell, the third film in the Firefly family saga, is tentatively due in early 2019.